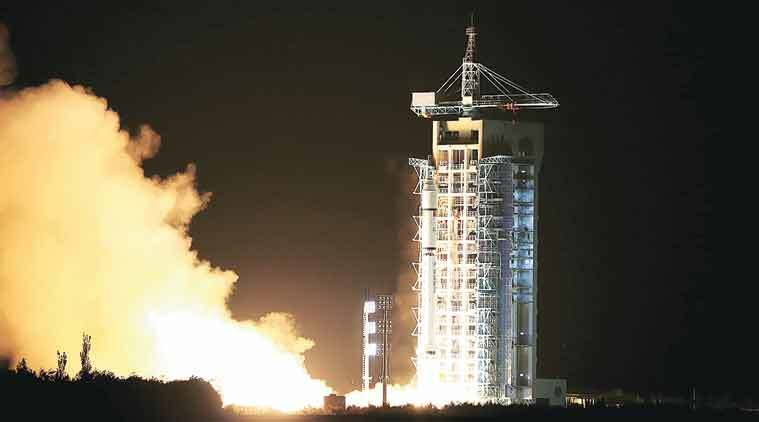 A satellite launched by China last week is focused on the quantum property of ‘entanglement’ — what Einstein called ‘spooky action at a distance’. How will it boost ongoing research on photon pairs? With the launch of the quantum satellite Micius, China has pulled ahead of the pack in the race to harness the effect which Einstein had colourfully termed “spooky action at a distance”, which could take communication and computing to a new level. However, Micius is not a standout achievement, as the media coverage seems to suggest, but one of many projects driving towards a quantum solution to communications security, quantum computing and even a quantum secured Internet. Developments on all three fronts have been reported over the last 12 months, and China’s new commitment to original research with Micius will propel the whole process forward. All these goals — security, computing and Internet — leverage two weird properties of subatomic particles, such as light-bearing photons. The first is superposition, whose popular face is the grin on Schrödinger’s cat, a theoretical creature trapped in a can with an agent which can randomly cause its death — or not. Schrödinger rued the day he thought up the little beast, which is in the superposed state of being both dead and alive until you peek in to see how it’s doing. At that point, it assumes either state. In the quantum world of subatomic particles, it is normal for things to be in multiple states until they are observed or measured, when they ‘collapse’ into a single state. Superposition should allow the facetiously named ‘qubits’ of quantum information systems to store, process and transmit bigger and more complex payloads of data than the processor in your smartphone, which can compute only in zeroes and ones. Let’s keep it simple. In this context, all that entanglement needs to mean is that if you know a property of one entangled particle, you know the corresponding property of the other. The two form a system, and a description of one is incomplete without that of the other. In the Newtonian world, if you’ve lost one of a pair of shoes, you can infer whether it was the left or the right from the one you still have. Something like that works at the subatomic level, too. Which need not bother our little heads at all, since quantum security is bulletproofed by something else — the ‘observer effect’. Observing or measuring an object changes its quantum state, when the observer interacts with it. In the largescale world, when the doctor takes your temperature, his thermometer takes a tiny bit of heat from your body, temporarily reducing local temperature by a smidgen. Cryptography, which is invoked every time your computer updates itself, connects to servers using protocols like SSH, signs your email or makes a financial transaction, depends on a key-pair exchange. A key pair consists of two random strings of numbers generated from very large primes. They are paired but not identical. In the commonly used asymmetric encryption, one of the pair is public and is published to the Internet. Secure communications are encoded with a private key, which the recipient machine can decrypt by downloading the sender’s public key. Key-pair encryption is hard to crack, but not impossible. As computer speeds increase, keys become more vulnerable. But the quantum computer, which could decode current keys in a flash, lags far behind the simpler project of quantum key-pair encryption. The idea is to create and share a pair of entangled photons which serve as keys (Micius will beam photons to stations in China and Austria). A conventional key cannot signal that it has been cracked, but because of the observer effect, an attempt to intercept a quantum key would reduce it to junk data. So it’s the end of the line for bank fraud and online espionage, which infiltrate the web of trust which protects Internet communications. But Micius is not alone in space. The lead was taken by SPEQS, a joint project of the National University of Singapore and the University of Strathclyde, which reported success in creating correlated photon pairs in orbit in May in the journal Physical Review Applied. Though SPEQS is a tiny thing the size of a Raspberry Pi and is launched in microsatellites the size of a brick, it took the first step towards entanglement in space and demonstrated the feasibility of satellite-based quantum network nodes. It was a crucial step, since a global secure communications network must be satellite-based. In February, a team of researchers from the Universitat Autonoma de Barcelona and the University of Vienna reported asymmetric entanglement between three photons in multiple dimensions in the journal Nature Photonics. While SPEQ and Micius focus on communications between two computers, this opens the door to secure many-to-many communications — in short, a quantum Internet. The quantum computer could be a commercial reality sooner than we imagine. Now, work with entangled photons is laying to rest the nightmare scenarios associated with quantum computing — the death of security and privacy. It is fitting that the solution, too, uses a quantum phenomenon.